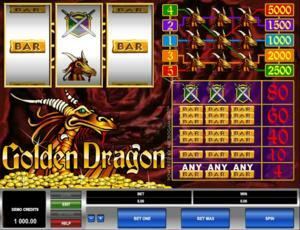 Golden Dragon is a classic online video slot game from Microgaming that has been released in November 1999. This online video slot machine game has 3 reels and 5 pay lines. The theme of Golden Dragon is, as its name implies, about a golden dragon that hoards and guards its gold treasure in its lair. A lot of people often wonder why dragons guard gold if they do not have any use for it. Dragons actually do not guard gold – they hoard it, and only the male dragons do this. Similar to bowerbirds, male dragons do this to attract a mate. Also, if a dragon sleeps on his hoarded treasure for a long time, some of the treasure will become embedded in its belly scales, which in turn gives it extra protection to this vulnerable area of its body. Most people, based on the movies they see about dragons, think that these creatures are naturally evil. Dragons are actually believed to behave just like humans do, so they can either be good or evil. With that said, do not worry about entering the Golden Dragon’s lair as it is actually a very good one as it will give you part of its gold treasure just by playing its online slot game! Many online slot players love playing this classic slot machine game as it brings out a genuine impression of a real land-based casino slot machine in every way. On the game screen, you will see the Golden Dragon proudly perking up its head sideways on you, looking at you in a menacing way as you attempt to hit winning combinations on the reels. Most Microgaming online slot games are available in 2 formats. The first format is the one preferred by most players, which is the download format. The second format is the Flash or browser-based version, which means there is no need to download anything at all. Whether you like to download or not, Microgaming has slot games for all your slot gaming needs. Good thing that Golden Dragon is available for instant play, so you do not have to download anything to find out if this game interests you enough in a way that you would like to spend some real money on it. The Golden Dragon online slot game is a great starter game for newbies when it comes to online slots. Even the more experienced players are guaranteed to have a fun time playing this particular slot game as it offers great prizes with only 25 cents as its starting bet! The Golden Dragon online slot game features 3 reels and 5 pay lines, no fancy stuff to remember, a wild symbol, a maximum coin jackpot of 5,000, and a maximum cash jackpot of $25,000! The quality of the graphics and sound provided by Microgaming software is without doubt outstanding. They possess a track record of creating the most spectacular graphics and realistic sound effects. A lot of online slot players love Microgaming because its online slot games have smooth animation and amazing yet non-intrusive background music and sound effects. Since it is essentially a no-frills type of slot game, Golden Dragon has been designed to have a simple classic slot game with matching sound effects. The casing of the reels includes the reels, buttons and the payout table. The overall graphic design of Golden Dragon shows a golden dragon guarding a dark cave full of gold treasure and other worldly riches. When you form winning combinations, you get to see the gold dragon on the game logo slightly blinking and snarling back at you, with its nostrils flaring! In Golden Dragon, the sound effects used will make you imagine like you are trekking inside a deep dark cave, with the sound of dripping water echoing in the cave. You also get to hear the dragon mildly snoring while it guards its treasure. Theme-related sound effects will surely make you feel some anticipation building up when you spin the reels. When you manage to form a winning combination, a tinkling sound with a dragon’s growl will be played out. There are no regular card deck symbols available in the Golden Dragon online video slot game. The regular symbols that you will find in the Golden Dragon slot game are the 3-Bar, 2-Bar, 1-Bar, and the Shield. The Wild Symbol is the Golden Dragon symbol. The Golden Dragon wild symbol acts as a substitute for all other symbols in order to you help you form winning combinations. Multiple Golden Dragon wild symbols on an active pay line will help you form winning combinations (please refer to the payout table). There is no Scatter Symbol in the Golden Dragon online slot game. Since Golden Dragon is a traditional, old-school 3-reel slots game, there are no bonus features in this game. Golden Dragon has 3 reels where you may bet on 5 pay lines. The minimum bet is 0.25 and the maximum bet is 20.00 per line. You can wager only 1 coin per pay line. Thus, the minimum amount you can bet is 0.25 and the maximum amount you can bet is 100.00 per spin. The maximum payout in the regular Golden Dragon online slot game is 5,000 coins. People who often play online casino games obviously love to stay longer on online slot games that have an Autoplay function. Good thing that Golden Dragon comes with this nifty function! In Microgaming online slot games, they have 2 game modes – Regular mode and Expert mode. You can have the game spin automatically for you with the Autoplay function that can be found by clicking the Expert button (located at the lower left portion of the game screen). After customizing the Autoplay function to your preferences, just click on the Start button, and the game will automatically spin for you while you just sit back, relax, and enjoy playing this golden dragon-themed online video slot game!